Integrated Pest Management: Current Concepts and Ecological Perspective presents an overview of alternative measures to traditional pest management practices using biological control and biotechnology. The removal of some highly effective broad-spectrum chemicals, caused by concerns over environmental health and public safety, has resulted in the development of alternative, reduced risk crop protection products. These products, less toxic to the environment and easily integrated into biological control systems, target specific life stages or pest species. Predation — recognized as a suitable, long-term strategy — effectively suppresses pests in biotechnological control systems. Integrated Pest Management covers these topics and more. 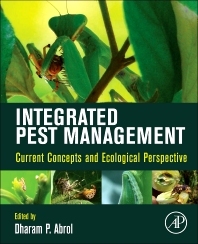 It explores the current ecological approaches in alternative solutions, such as biological control agents, parasites and predators, pathogenic microorganisms, pheromones and natural products as well as ecological approaches for managing invasive pests, rats, suppression of weeds, safety of pollinators, role of taxonomy and remote sensing in IPM and future projections of IPM. This book is a useful resource to entomologists, agronomists, horticulturists, and environmental scientists. 1.1 Introduction – What is Plant Resistance? 13.6 What Will be the Role of Bioherbicides in the Future?